I love tag posts - depending on what the topic is or what they're about they are always very interesting. 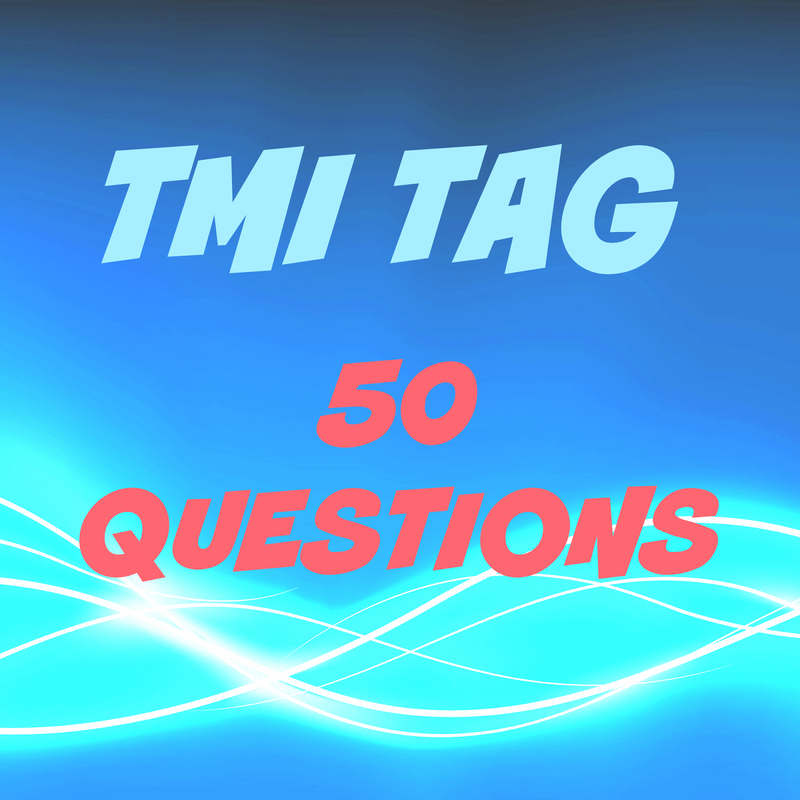 I noticed I hadn't done one in a while (I think my last one was the Taylor Swift 1989 Tag) so I thought the TMI Tag: 50 Questions was a great post to do. I'm wearing a t-shirt, blue chinos and stripey socks. Yes, and I still am (3 1/2 years). Yes, my first relationship was terrible - I won't go into details. I'm quite small - I'm only 5 foot 5 inches. I weigh 9 stone exactly. None - but I do want some. I used to have my tongue pierced (I've had it done twice) but taken it out and its healed up. I currently have my left ear pierced and I'm in the process of stretching it. Can I choose only one? I have about 10 at the moment - if I had to choose Once Upon a Time. I really like Kelly Clarkson at the moment as her new album has just been released. I know she isn't a 'band' but I don't care! Working with all my school and old friends at the ice cream factory/attraction centre. Was great fun! Someone who cares about you, is interested in you, looks don't bother me that much and thinks about the future. I'm loving Elena Gilbert from TVD at the moment. That's Nina Dobrev (I think). It depends on what kind of music and the mood I'm in - but it's a catchy tune then I like it loud. Normally the shower so I can think. It depends on my mood - if I have time then maybe 15 minutes otherwise 5 minutes (which is clothes on, teeth cleaned and out the door). I got into a scrap with a irish man once - he grabbed me by the neck but luckily my friend was there and grabbed him and pulled him off me. Other than that fighting with my brother - does that count? Caroline's mum (Sherif Forbes) died of cancer in TVD. Well I first joined YouTube years ago and set up the name 'mrjohnagnew' because 'johnagnew' was already taken - but it's just my name - plain and simple. Zoella (or Zoe Sugg)'s Girl Online book - really good and fun to read - more a girly book but I still enjoyed it. I'm currently 3/4 way through Shane Dawson's 'I Hate My Selfie' book - it's really good. There is a chicken and bacon pasta bake in Tesco for about £3.50 and I love it - buy it all the time. I've got my celebrity crushes - but I don't really look at anyone in that way since I'm not single. When I said goodbye to my boyfriend before he went to Canada for 6 months. Can't really remember - I'm sure people say lots of insulting things behind my back though. I like mint or citrus. I used to play the recorder in school but that was about it. I had some lessons on the piano and guitar but probably forgot all that now. When I first started making a bit of money - I bought myself a Links of London bracelet from their little shop in Convent Gardens. I can't even remember. I did some swimming a few months ago but then stopped. Probably 'Style' by Taylor Swift in the car on the way to work this morning. I have no idea - I don't think I have ever used a chat up line on anyone. Last week I visited my friend Katherine in Liverpool. Let me know if you have done this before or if you do - do it - then link me up in the comments below.